For some of us, summer is all about beating the heat chilling out. Whether we’re floating on a river, relishing an air-conditioned room, or licking our sticky popsicle hands: there is something satisfying about mastering the summer elements. 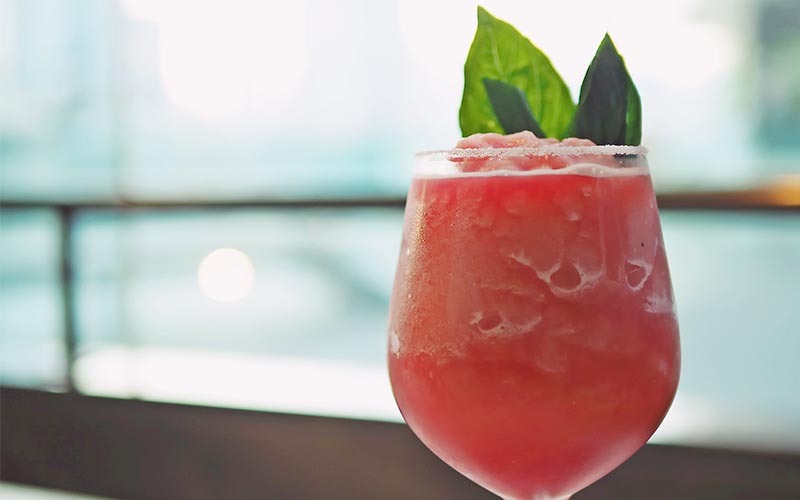 Explore 9 of our favourite blended drinks for lovers of wine, beer, coolers, and cocktails! The team at an ANBL store near you would love to help you track down any of the products below, or even fine-tune any of these recipes for your specific occasion! Knocked out cold? Warm up with 6 summer BBQ recipes. Let's revive this summer classic with a twist. Dive into an orange float to break the heat this summer! Place 2 – 3 scoops of vanilla ice cream in a tall glass. Slowly pour 1 cup of Henry’s Hard Orange Soda over the ice cream. Enjoy! Frozen margaritas are essential for any summer gathering, so why not throw a few Black Fly Tequila Margaritas into the freezer while you prepare for the bash of the summer? Easy peasy! Transform Black Fly Tequila Margarita into a delicious frozen cocktail. Simply place any Black Fly bottle in the freezer and freeze to frozen. Let stand 5-10 minutes and squeeze into a cocktail glass for the ultimate slushy refresher. This cider cocktail comes with a classic twist, for old times’ sake. In a mixing glass combine whiskey, simple syrup, and fresh lemon juice. Add ice and shake for 15 seconds to blend flavors. Strain over ice and top off with Angry Orchard Cider. A delicious chocolate shake … made delicious-er with stout! Pour all ingredients into a blender and blend just until mixed. Pour the mixture into two pint glasses and drizzle with caramel syrup and top with few chocolate-covered espresso beans. Give your Margarita a facelift! In a blender, combine everything except for beer and blend until smooth. Transfer the mixture into a pitcher and add beer. Rim the glasses with lime juice and salt and fill with margarita. Enjoy! Make-ahead tip: you can freeze the beer margarita in freezer until ready to serve. You can add beer before or after freezing. This is a quick and easy white wine drink to whip up on those hot summer days! Adding the frozen peaches gives your sangria a twist for the perfect way to cool off. Combine all ingredients in a blender and mix until smooth. Serve in two glasses immediately & enjoy! Pour your bottle of rosé into a 13x9" pan, freeze until almost solid. It won't completely solidify - it should take about 6 hours. In a saucepan, bring the sugar and half of water to a boil. Stir constantly until the sugar dissolves. Add your strawberries, then remove from heat and let sit for 30 minutes to infuse the syrup with the strawberry flavor. Scrape your rosé into a blender, add lemon juice and 3 ½ ounces of strawberry syrup and 1 cup of crushed ice. Purée until smooth. Transfer from blender to freezer and freeze until frosé is thickened like a milkshake - about 30 minutes. Blend one more time until frosé is slushy. Divide among glasses and serve! It’s creamy, it’s Canadian, and it’s delicious! Blend until smooth. Pour into a glass and top with whipped cream or ice cream. Daiquiris have long been an indulgence we order at a resort or restaurant, but a good blender can make these an at-home treat!